Ok, so, you’ve done it. You have a Facebook page and your number of fans is growing. You’re looking good and your page is finally on track. Now you want to advertise your presence on social media. The only problem? http://www.facebook.com/home.php#!/pages/YourPageNameHere/139703914649 doesn’t exactly roll off the tongue. You need at least 25 fans before you can claim a vanity URL. Users (thats you!) can only have one username for their personal profile. Similarly, Facebook Pages can only have one username for each Page. Once you have established your Facebook Vanity URL, you can not change it. So, choose wisely (You can, however, change your personal username once). I generally recommend that clients keep all channel usernames and URLs consistent across all social media channels. For example my employer, Conversify, ends all channels with ‘Conversify’ (naturally!). Check ’em out: Facebook & Twitter. 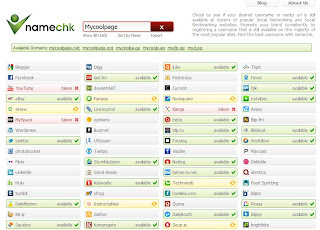 A great place to check to see if your usernames are available is Namechk. First, visit HERE (If you haven’t set your own PERSONAL URL yet you may have to do that before proceeding). Select “Check availability” to check for available usernames. If the desired username is available, click “Confirm” in order to confirm your choice. Really trustworthy blog entry I have ever found.. Its also informative information.